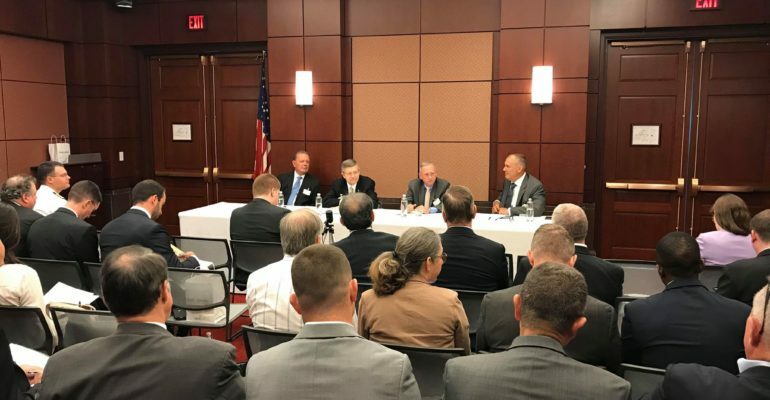 (from left to right) Mr. Rich Ritter, Mr. Rickey Smith, Mr. David Trachtenberg, and Mr. Riki Ellison at MDAA's 19th Congressional Roundtable on July 10, 2018 at Capitol Hill. Below is my introduction to our 19th Congressional Roundtable on July 10, 2018 at Capitol Hill. We were honored to have on the panel Mr. David Trachtenberg, Deputy Under Secretary of Defense for Policy, Mr. Rickey Smith, the Deputy Chief of Staff (G-9) for U.S. Army Training and Doctrine Command, Mr. Rich Ritter, the Program Executive of C4ISR at the Missile Defense Agency. Click here to watch the full Congressional Roundtable on “Missile Defense C2 in a Cross Domain Environment,” and read the transcript. Good morning everybody, I am Riki Ellison, the founder and CEO of the Missile Defense Advocacy Alliance. We were founded in 2003, right after my gentleman that is about to speak, Dave Trachtenberg, helped move the ABM Treaty and released from the ABM Treaty, and we were formed to help educate the American public. Our mission and we believe fiercely that missile defense and deployment of missile defense makes our world a safer place and a much more stable place, and we are seeing that today. Our President is engaged in talks, we haven’t seen testing or nuclear testing from North Korea. There was a huge achievement last year of our GBI shooting down a realistic target representing a North Korean threat. That gave, I believe, great confidence to our nation and to be able to engage in those types of talks. So we continue to believe and press forward in partnership, globally with our allies to get as much of that capability out and about. We are here today to open up the discussion on something that is not really visible from the public perspective, the C2, command and control of a cross-domain missile defense capability. We are transitioning from a single threat, ballistic threat, that we have become very good at defeating and negating, to a near-peer competition, a near-peer competition in other domains, especially space. And we are developing systems, both sensors terrestrial, we are going to be developing systems in space to have sensors and interceptors that are going to be in various domains, and being able to coordinate what that best sensor is and what that best shooter is, and be able to give it to your solution set and firing control without much latency is the future, is where we have to go to win and to deter capabilities that we are facing down the threat. We are very honored to have an acquisitions expert here, honored to have a warfighter here and our policy expert here, you can see a combined viewpoint of how they are looking at this problem to resolve and create solutions to make our country more capable than it is in bringing those different domains together and get that command and control aspect of it. We are going to have a 5-10 minute discussion from each of our presenters and then we will open it up to questions, I would ask you to refrain from questions on the MDR, this is a cross-domain discussion here on C2, let’s keep it that way. Our first speaker today, Rich Ritter, who spoke with us, with Sam Greaves back in 2015, when he was head of SMC, Rich is coming from MDA where they have the cross-domain C2 for a system, for linear system, that is in operation, a ballistic missile defense system that they have created, developed, and put forward and is operational. So I think it is one of the only in the world that crosses all those domains and is effective today. For his title, he has been involved in missile defense since he was with the Strategic Defense Initiative in September 1990, and he currently serves as the program executive for the Command, Control, Communications, Computer, Intelligence, Surveillance and reconnaissance with the MDA.